“Where is grandma?” I asked the children after we hiked down from the steep slope of the Oracle of Delphi in Greece. 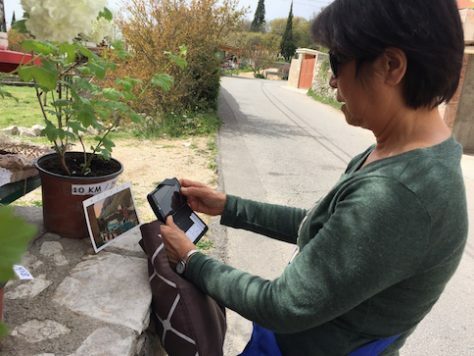 For the past one month of traveling with my 73-year-old mother or the children’s grandma in Eastern Europe, “toilet” became the topic sentence of our travel adventure. It seemed as if everything we did, said, saw, or eat couldn’t escape from the clutches of the “toilet”. 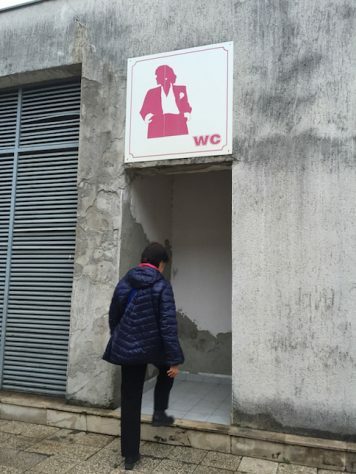 Grandma has a good eye for spotting public toilets. Everywhere we went, we felt as if she was constantly scanning the environment for the “WC” sign. Although her eyes were not as good as when she was younger, she always saw the “WC” before us. 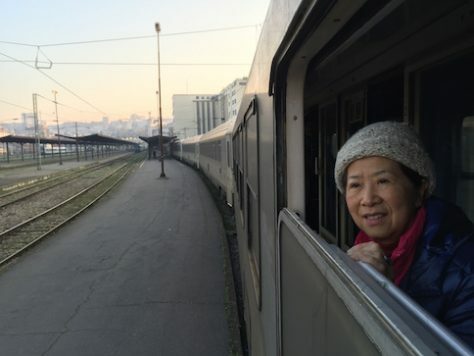 Grandma took many night trains with us as we travelled through Eastern Europe. 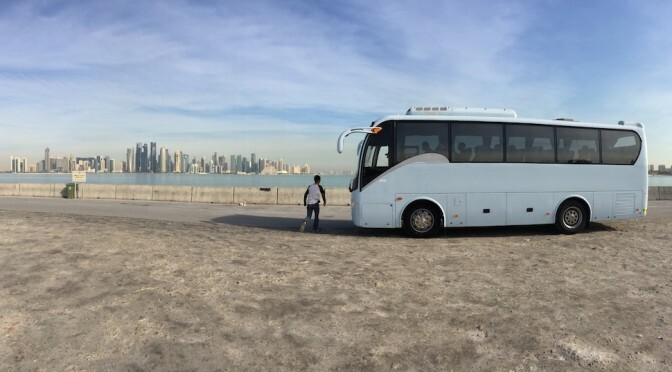 Our children are very particular as to whom they feel comfortable traveling with. 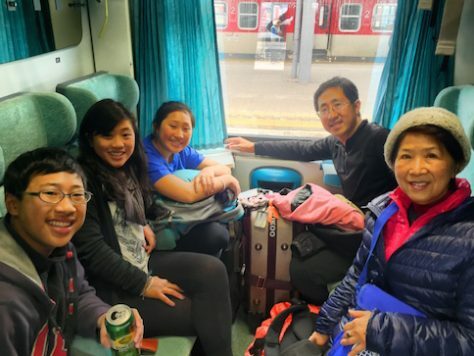 I would not have asked my mom, if they didn’t ‘approve’ and if they were not so enthusiastic about having Grandma travel with us for a period of time. I was hesitant because I was not sure whether we are able to accommodate our travel style to hers. However, seeing how much the children wanted to share the joy of our travel with her, I decided to ask her. 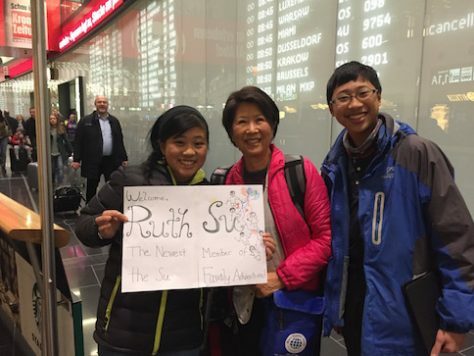 The children greeted Grandma in Vienna airport as she joined us as our newest member on March 10th for one month in Eastern Europe. My mother would never leave my father at home alone, being afraid that he would not be able to take care of himself. However, in March my father was traveling for almost a month so she felt free to do whatever she wanted. 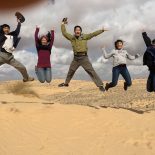 After following our travel in 2008 and now again in 2015/16, my mother changed from being against the way we travel so “dangerously” with our children to now considering and actually traveling with us. We were both surprised and happy at the same time. We had a big celebration the first day Grandma arrived at Vienna in my Aunt Esther’s home. We had a fun time sharing old memories together with Grandma and Aunt Esther, Uncle David, and cousin Janica. 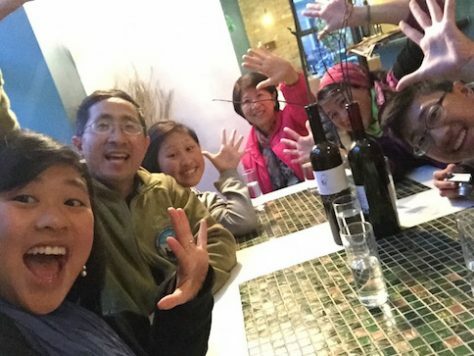 After traveling for 9 months, we really enjoyed spending time with close relatives. 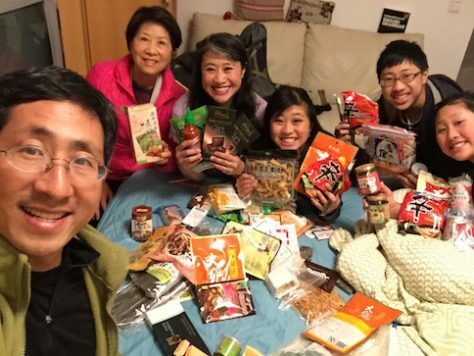 Grandma replenished our travel supplies such as Korean instant noodles, Malaysian soup mixes, Sichuan hotpot spices, bars of chocolate, toothbrushes, and dental floss. 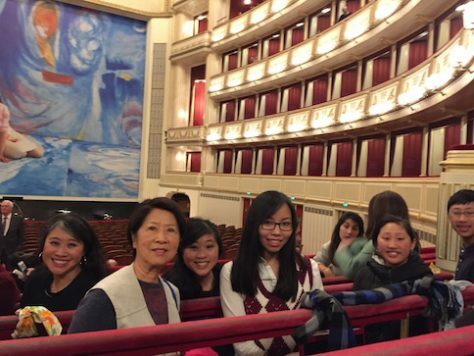 We were in heaven!”Do you think you can stand for a few hours to watch opera at the world famous Vienna Opera House?” I asked my mom on our first day of traveling together. Grandma came and supplied us with goodies that we missed so much during our one year travel. “Standing is not a problem for me. Problem for me is sitting as my leg gets numb,” She assured me. One secret about the Vienna Opera House is that while regular seat ticket is around 100 Euro, standing ticket is only 4 Euro. 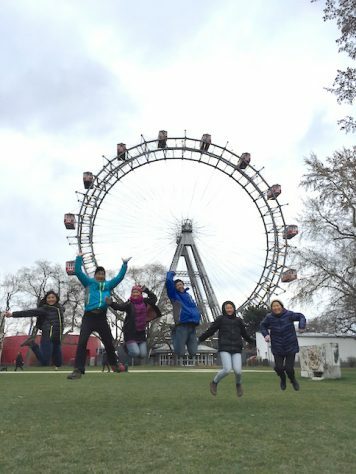 In the Chinese language textbook that Olivia, Nathan, and Joani studied in local Chinese school, the Vienna Opera house was described in one of the lesson, which they still remembered. It was too good to pass up! We got cheap standing tickets in the famous Vienna Opera House. Although even for standing room we each had an English subtitle screen in front of us, the opera was three hours and near half way point Grandma, who was getting tired, volunteered to go back home early with Joani who was sick.The next day, Grandma woke up early with us to listen to the world famous Vienna Boys Choir at the Sunday mass in the Royal Chapel downtown. Again, a seat would cost around 30 Euro while standing room in the back was free! The mass lasted about 90 minutes. Half way through she left and went outside the entrance door where she could sit and see the inside through a TV monitor. 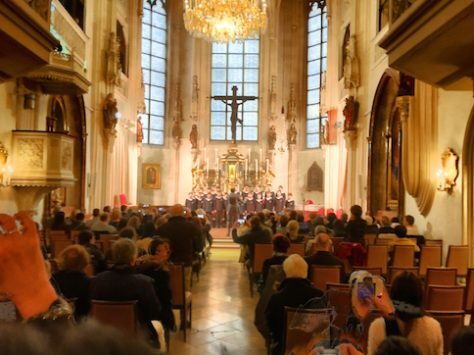 We stood in the back of the Royal Chapel to listen to the Vienna Boys Choir. “Ah Jon (the name my mom usually addresses me), you should have come outside with me. 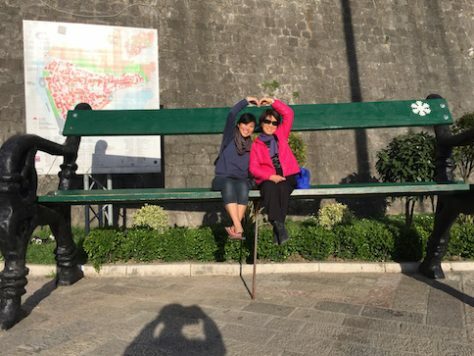 It is better outside than inside,” my mom told me excitedly after the mass. “You can see the Boys Choir up close on the TV monitor while sitting. I took many photos through the TV monitor!”Although both times Grandma didn’t last through our torturous way of sightseeing, we were amused and amazed at how she was able to cope and enjoy in her own way. One very amusing habit of Grandma that the children noticed was that instead of taking photos of the sceneries in front of her, she liked to take photos of postcards in souvenir shops. Grandma likes to take photos of postcards. “Why do you do that?” Joani asked once. “Then why did you buy these two postcards?” Joani continued asking. “The store owner saw me taking photos so I bought them!” grandma explained with a bit of embarrassment. Afterwards, whenever we saw postcards we would think of grandma and how cute she was. We would even take photos of the postcards as well. It became our way of remembering our time with grandma. After Vienna, we left for Budapest in Hungary, where we stayed with the parents of Olivia’s American high school teacher Ms. Lingenhoel. Despite having lived in the US for more than thirty years, Grandma had never stayed in an American’s home. She was fascinated by the experience. Grandma and us enjoyed our time staying at the home of the Lingenhoel in Hungary. At Budapest, we also went on a 3-hour free walking tour of the old town. As expected before the tour, she happily paid for using the toilet in a souvenir shop knowing that the tour is long. 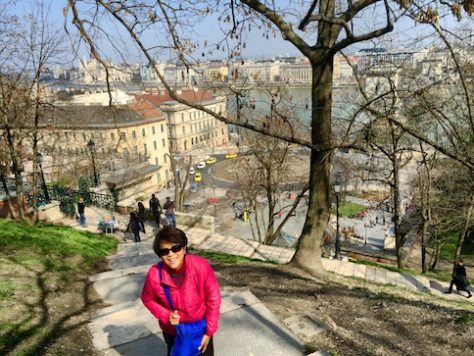 We were surprised how she kept up with walking long distance and climbing up the big hill to the Buda castle. When she fell behind the tour several times, one of the children, Annie, or I would take initiative to hold her arm and walk with her. Grandma was a really good trooper as she walked up and down the old city of Budapest during the free walking tour. 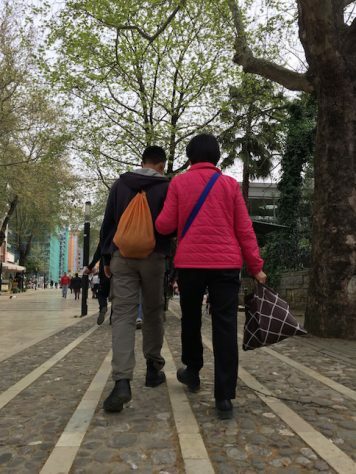 Nathan was very kind in holding Grandma’s arm when we went on long walks during the free walking tour in Tirana. There at Budapest Grandma joined our “one on one date” for the first time. 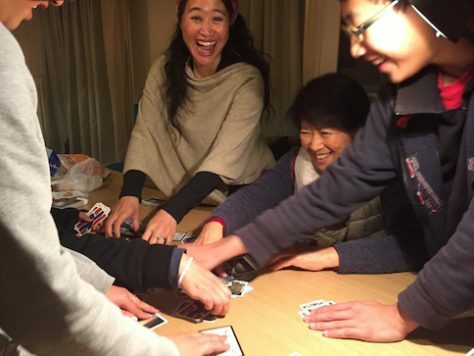 Our “one to one date” tradition consisted of taking turn to pair with a different family member each time for a date with the condition of a spending budget of 50 RMB and having real deep conversations to get to know things we don’t know about each other. 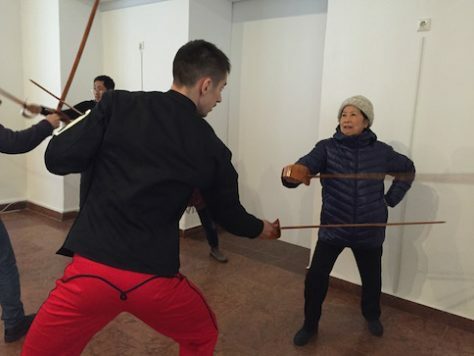 At Budapest, even Grandma bravely learned fencing with us. The children all voted for me to be paired with Grandma for her first “one on one date”. “You two need to know each other better,” they reasoned. “I know my mother very well,” I responded to their unbelief. “Do you even know her favorite color?…” Olivia asked. Jonathan and Grandma had cheesy Lango fried bread together for their first one-on-one date. 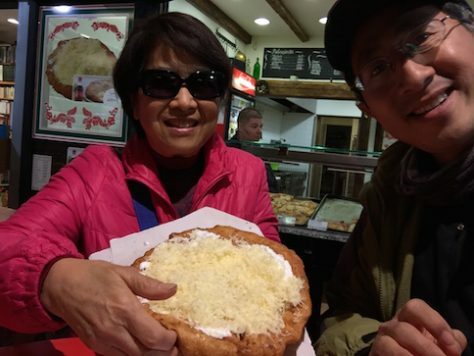 Over a gigantic oily cheesy fried bread dough (Langos) at an underground street stand next to the Budapest train station, we thought hard at what question we should ask each other. “What is your favorite color?” I asked her given that I couldn’t answer Olivia earlier. With these and other similar types of questions such as her common nightmares, I had my first one-to-one date with my mom in the exotic old town of Budapest! Thinking back, I realized that I often took my mother for granted. She has always played the role of my “mother” in my life, so much so that I often don’t see her as a person with her own personhood, dreams, and fears. The one-on-one date helped me to see her as a friend, not a mother, and gave me the desire to understand her more as an individual. 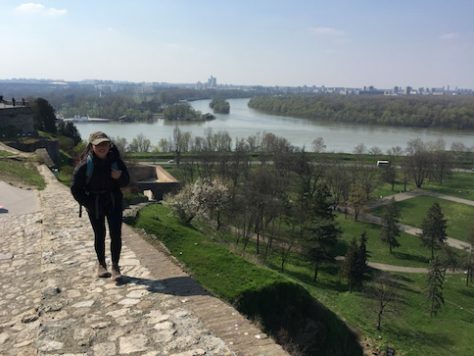 We all enjoyed the view from the castle of Belgrade overlooking the two rivers. Our next city was Belgrade, Serbia, the capital of the former communist regime of Yugoslavia. The old castle of Belgrade was situated spectacularly on top of a hill overlooking the convergence of two great rivers. So one afternoon while waiting for our night train, the children and I hiked up to the walls of the castle to play frisbee while my mom and Annie sat and chatted with each other. Near the end of the day, Olivia had a great idea! Reading in Belgrade our 2008 travel from our first book, Grandma and us had many good laughs. So as we sat on a bench in the parts, we begin to read the part where I and mom were arguing over my idea for the trip in 2008. “Haha, I just said that this morning!”, my mom realized. 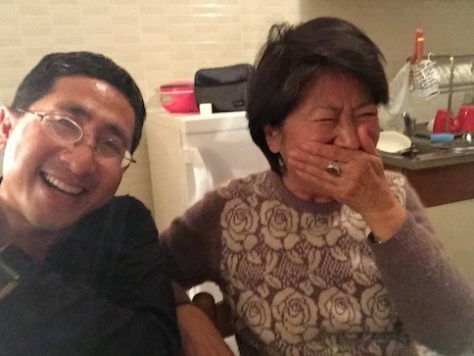 Grandma is so cute when she laughs. As my mom and I took turn to read the book out loud, the children and Annie couldn’t stop laughing. All the things she said 8 years ago, were still the same things she said even as she was traveling now in Eastern Europe. My mom has not changed much after 8 years! 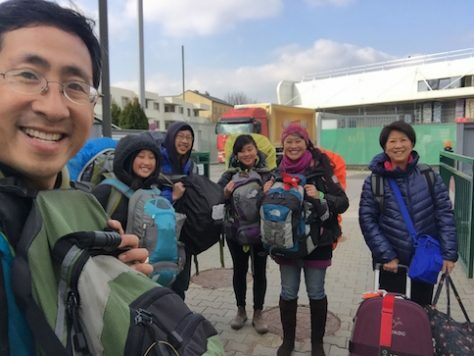 However, one big change is that she is willing to backpack with us this time, which for us is a major milestone of her recognizing the positives of what we are doing. That night before our train ride we booked to play a new type of interactive, team-building, puzzle game called “escape room”. The goal of the game is to escape a physical room that we are locked in by finding clues and solving puzzles within 60 minutes to arrive at the answer that will open the door. 60 minutes had never passed so quickly. We had no time to spare and everyone, including Grandma, worked intensely to uncover clues behind picture frames, through ordering Russian dolls, or through solving logic puzzles. It was wonderful to see the six of us that represents three generations helping each other and having fun together. We enjoyed our teamwork as we escaped from the Escape Room Tito in Belgrad, Serbia. 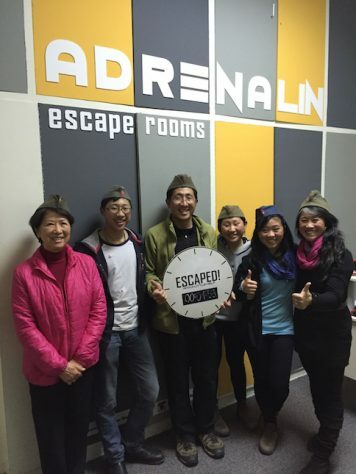 “We did it!” I shouted as we high-fived each other including grandma for escaping the room with only 1 minute and 53 seconds to spare. We all had so much adrenaline from the game that even as we boarded our train that night at 11:00pm, we didn’t sleep but still kept talking about the escape room. After a night on the train, we arrived in Sofia, Bulgaria in the morning. 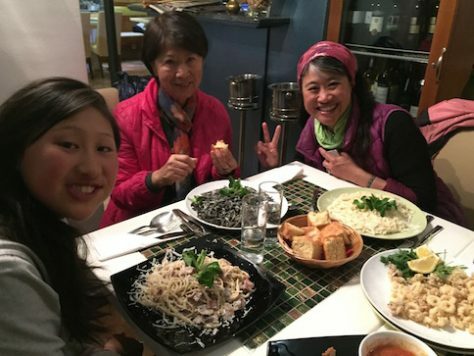 As a family of food lovers, we had a great time that same afternoon eating all over the old town on our only free food walking tour of our trip, called Balkan Bites. The free food tour in Sofia, Bulgaria, was the type of walking tour we all enjoyed. 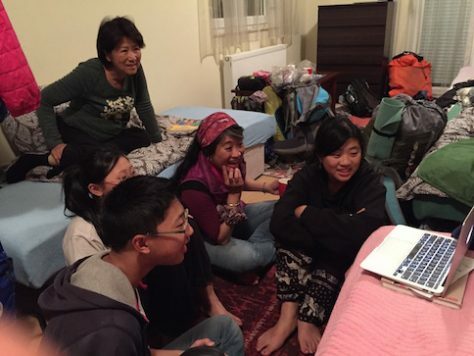 However, the children were even more excited about watching Korean drama with Grandma as a way to create shared memories. As a family we are crazy about Korean drama. During the school year, Olivia forbids us to watch because she was busy with her senior year. Now that we were traveling, we were able to watch three Korean dramas already. For our fourth one, a Korean version of Jekyll & Hyde, we were patiently saving it until Grandma arrived since Slovakia. I kept wanting to start but the children were very strict and didn’t allow me to even have a sneak preview. So during our 3 days in Bulgaria, we finally were able to have some free time for Korean drama. 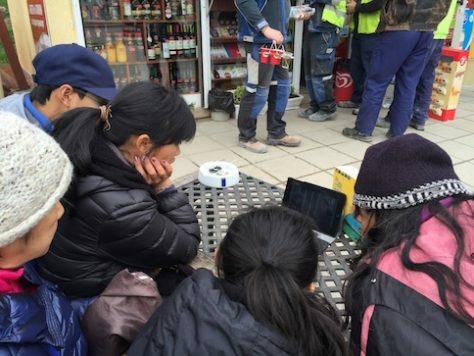 When we were waiting for the bus in Sofia, we caught up on some Korean Drama. We watched after dinner, during children’s homework break, and even while we were waiting at the bus stop to go up the snow mountain close to Sofia. 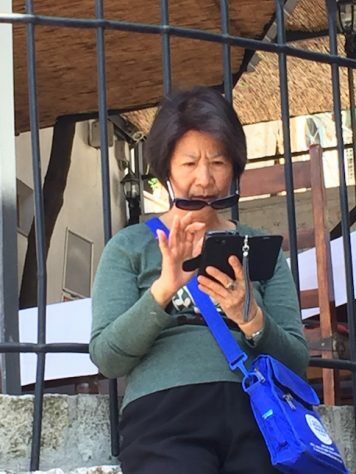 However, Grandma was not used to reading the Chinese sub-titles and started to lose interest. Unfortunately, once I am hooked, I have trouble stopping. The nagging from my mom got so bad that at one point I became quite upset and sat in bed sulking by myself. I felt that I have been a very good son and father with no bad habits or being irresponsible . 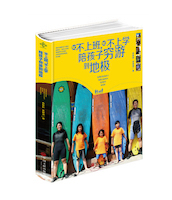 I took care of the family and planned the trip with diligence. Why did she kept nagging me about this “harmless” way of enjoying my free time? Fortunately, once we finished the 20 episodes of the Korean drama, the conflict disappeared naturally. Traveling backpacking style in Sofia, Bulgaria. After Bulgaria, we had to take two separate trains to reach Athens in Greece, one for 6 hours and one for 5 hours. When we travelled, we often take the night bus. However, to accommodate my mom’s fear of not having a toilet nearby, I tried to book trains instead even if it was more expensive or inconvenient. 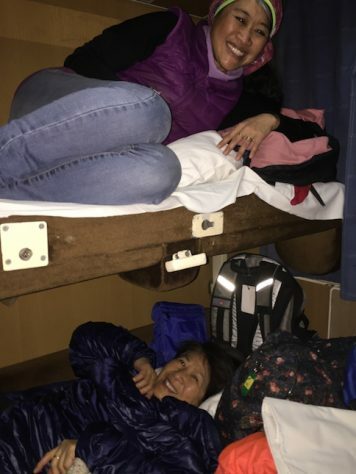 Luckily, the previous two night trains we took had couchette sleepers, which meant that we could lie down flat on a bed. However, in Greece there is no couchettes, only normal chairs. I was afraid for my mom that she would have a hard time sitting for so long due to her back problem. So for her, I booked her a 1st class seat while for the rest of us, we booked second class seats. 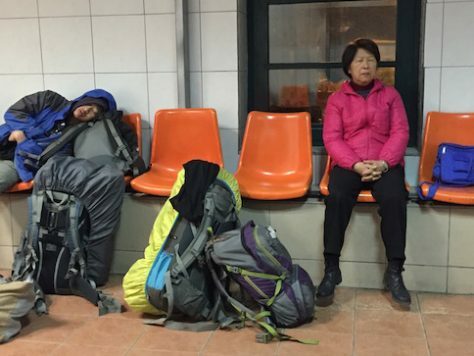 Grandma tried to sleep in the train station as we waited for the connecting train late at night. The next morning when we got off the train in Athens, I asked her with great fear how was her sleep. Surprisingly, she replied that she slept alright because there was an empty seat next to her so she was able to curl up and lie down on two seats! Her ability to adjust to our travel style really impressed me. Before, she often complained that the way we traveled was bad for the children. In result, I often thought of my mom as someone who is not able to handle challenging travel situations. Starting that day, I saw my mother in a different light. 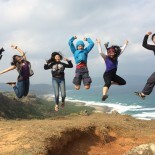 She is now really a member of our Su Family Backpacking Adventures Team! Hooray for Grandma! We took a photo on the hill where Paul preached to the Athenians about the “Unknown God”. When we arrived in Athens, my mom and I went to the supermarket while Annie and the children recovered from a tough night on the train. I was amused at how my mom’s eyes lighted up when she saw the fresh seafood section with several species of Mediterranean fish, octopus, squid, and shell fish. Ever since I could remember, my mom always enjoyed buying food more than clothes or jewelries. When we travelled, she especially like to try new food or dishes. She is the reason why I and now my children enjoy trying new food the most in our travels. For us, travel equals food. It is difficult for us to like the country if we don’t like the food. 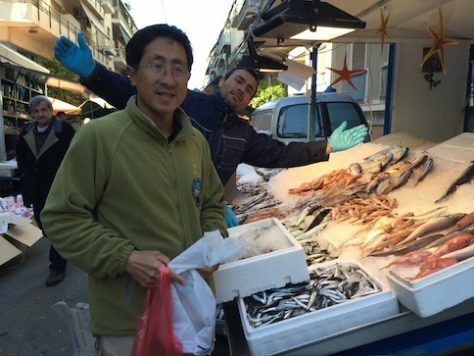 The fish market in Athens was a special treat for Jonathan and Grandma. 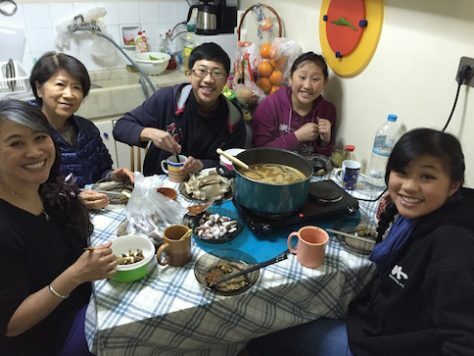 Our Sichuan spicy hotpot dinner in Athens was one of our highlight with Grandma. That night we used the mouth-watering Sichuan spicy hot pot mix my mom brought from the US and had the most tasty seafood hotpot since we left China 9 months ago. 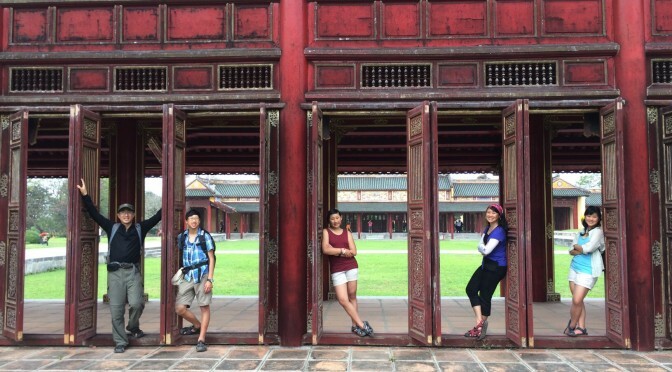 It made us really miss home back in China. In addition to our home cookings, we got to taste authentic Greek cooking of moussaka, Greek salad, and fried zucchini at my MBA classmate Nico’s home. 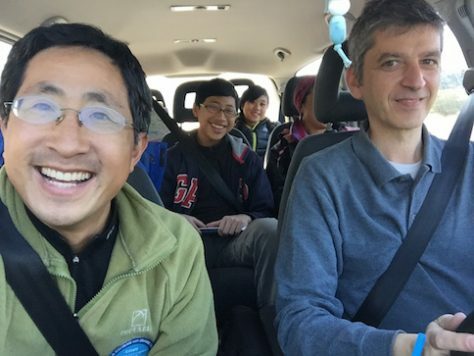 Nico also took us on a two-days road trip to Olympia and Delphi in the peak of beautiful spring season. 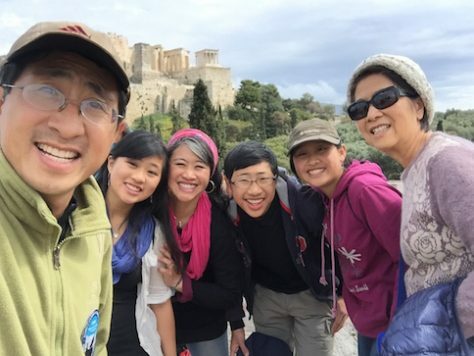 Nicos, Jonathan’s MBA classmate, took us on a beautiful two-day road trip in Greece. Thanks to Grandma, we enjoyed sitting on the 1st class train seats. 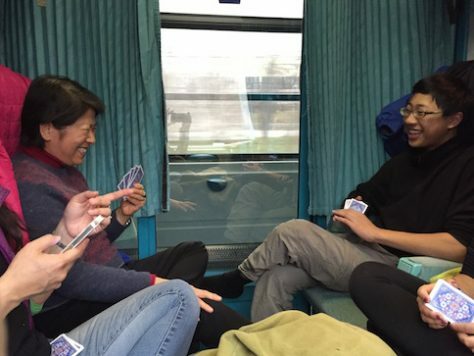 We took many fun train rides with Grandma during our one month in Eastern Europe. 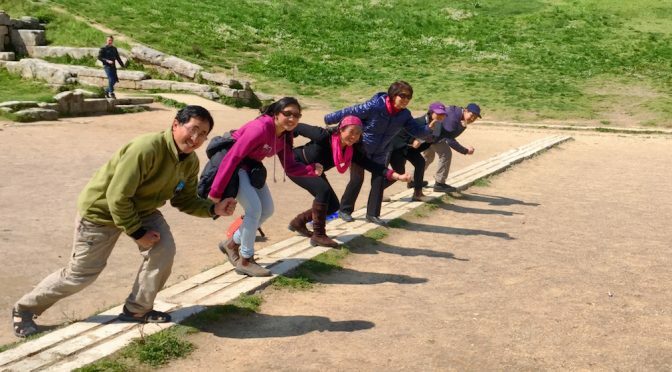 “I am not walking another step!” my mom declared suddenly. “How can you do this? Why didn’t you get a taxi?”I was in shock. Annie was in shock. The children were also in shock at Grandma’s protest. After we got off the bus at Ohrid, we started to walk to our rented apartment near the lake. After walking for 15 minutes, instead of the children protesting as usual, it was my mom that protested by refusing to walk. Grandma always insisted on carrying her own luggage as we moved from city to city. After the children and I reached the rented apartment, I went back for my mom. She was still sitting where she had stopped. 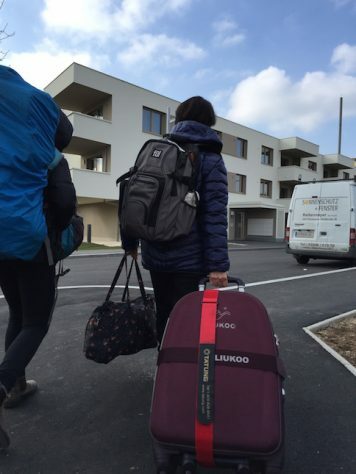 I took her luggage as we walked towards the apartment. Grandma was very happy to ride in the door-to-door transfer shuttle between the cities. After Macedonia, when we travelled to Albania, Montenegro, and Bosnia, I took her advice and got door to door taxi or direct shuttle services. She was very happy. The children were very happy. I was happy that everyone was happy too! We all enjoyed the view over the Ohrid Lake in Macedonia. 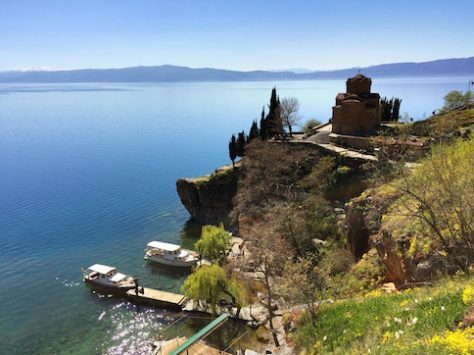 Another highlight of our time in Macedonia was walking along the beautiful lakeshore of Ohrid. My mom said many times that having lunch on the scenic shore of Lake Ohrid was one of her highlight,consistent with her love for good food. 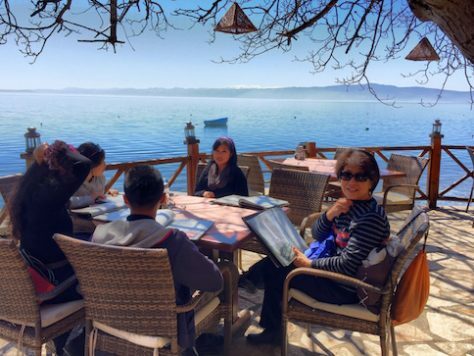 Grandma treated us to a scenic lakeshore lunch in Lake Ohrid. 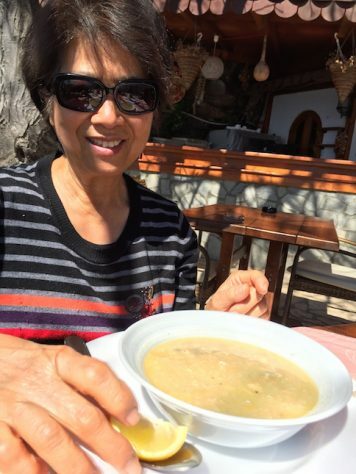 The fish soup by the shore of Ohrid Lake was very tasty and special for Grandama. After traveling for more than two weeks, the seafood lunch at Macedonia was our first proper restaurant meal with Grandma in Eastern Europe. We shared three bowls of fish soup containing flavorful and succulent flakes of different types of fish meat and innards. Grandma ordered fried smelt fish for main course while Nathan ordered Caesar salad with smoked salmon, Annie and I ordered cheeseburger, and Joani and Olivia ordered fried pork chops. It was so filling that during the subsequent one-on-one date, Joani and Grandma didn’t eat anything else. 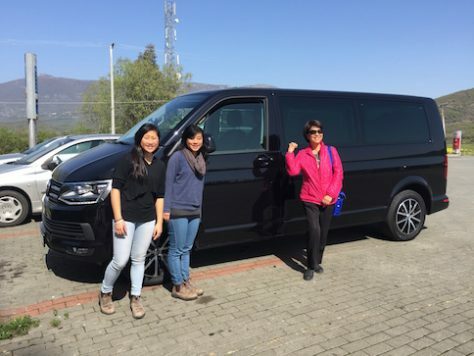 Grandma enjoyed our way of travel where we get to meet locals, such as Diana in Albania. 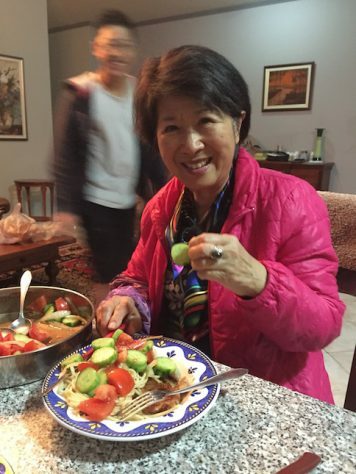 Our food adventure with Grandma continued in Albania when we proposed to cook a meal together with our AirBnB host. We brought over Greek salad that we learned while in Greece, traditional Chinese tomatoes with stirred from eggs and chicken, and noodles. 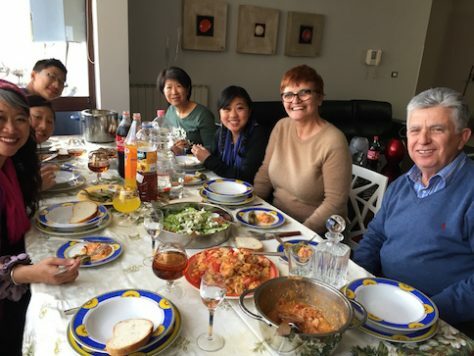 Our host, Diana, cooked their traditional Albanian dish of spinach pie and pastries and let us sample various types of their favorite drinks from their farm and when they traveled the world, such as cappuccino and grape and blue berry spirit drinks. 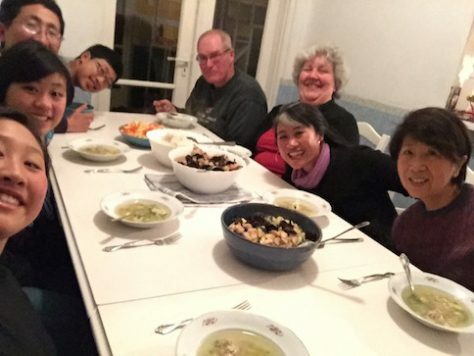 It was amazing how a simple thought of cooking together turned out to be a wonderful culture exchange and friendship. 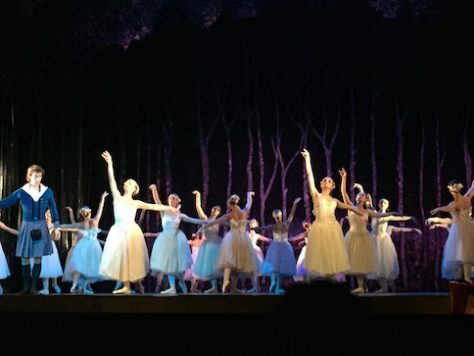 That night, we enjoyed watching the first ballet ever choreographed in the world called La Sylphide. Unlike in Vienna, we all got to sit down at the front row for only USD 2.5 per person! 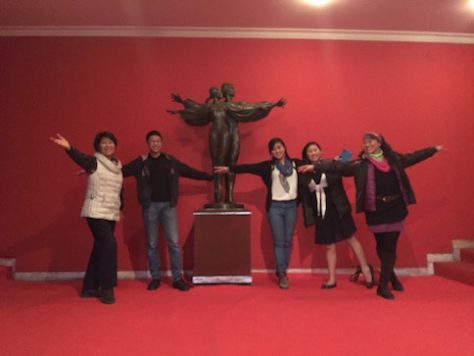 We watched ballet together in Tirana, Albania. Our next stop in Kotor, Montenegro turned out surprisingly to be the most beautiful town in our entire time with Grandma. The AirBnb apartment we stayed is inside an old fortress behind a 900 years old cathedral. The apartment itself is more than 300 years old as well but the inside was remodeled elegantly and comfortably. The fortress wall surrounds and towers over the hill behind the old town reminding us of the Great Wall of China. 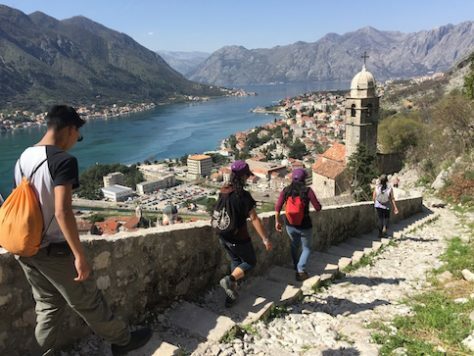 We walked along the old fortress wall of Kotor in Montenegro. 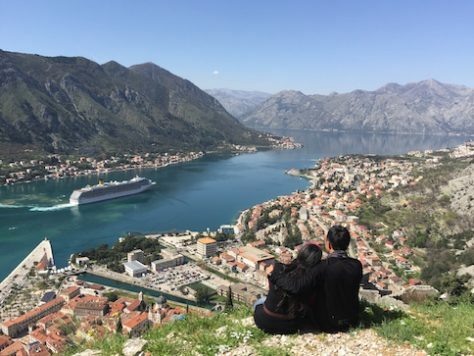 Sitting on top of the fortress of Kotor, Montenegro. 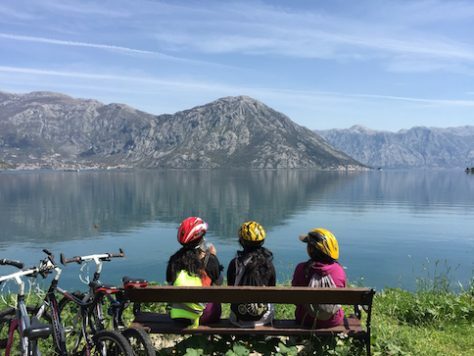 The bike along the Bay of Kotor in Montenegro was scenic. While we hiked up the mountain and down the fortress wall and biked along the shore of the Kotor Bay, my mom enjoyed herself buying cheese and dry-cured ham (Prosciutto) at the farmer’s market, buying necklaces for Annie, taking photos of postcards, and having an one-to-one date with Nathan. 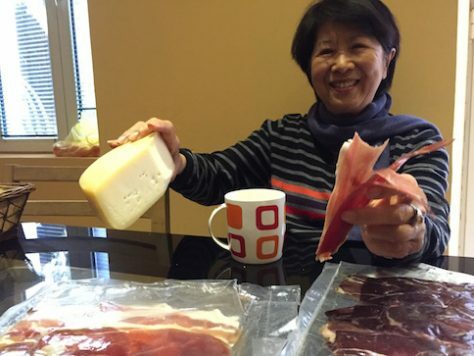 While we were hiking, Grandma enjoyed herself by buying cheese and meat. 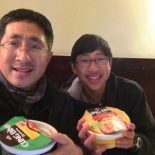 “On our date, I asked grandma about grandpa and great-grandfather, while I shared about growing up in the countryside of Luchun,” Nathan shared. “What do you know about Nathan’s personality?” Olivia asked Grandma curiously, also testing her memory. 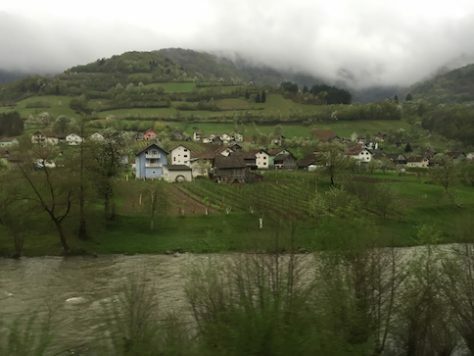 The scenery on the road in Bosnia was verdant and magical. The scenic countryside view on our way from Montenegro to Bosnia was stunningly green with lakes, pastures, and hills. Instead of staying at the capital, I decided to stay at a smaller town called Mostar. 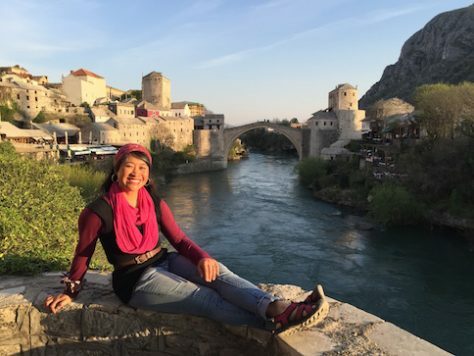 Mostar is famous for the ancient bridge where men would dive down to swoon girls and the center of ethnic conflict between Croatians and Bosnians from 1992 to 1994. The old bridge of Mostar in Bosnia & H.
The children were sad that grandma only had few more days with us, so while we were in Bosnia, we began to say goodbye to grandma by looking through all the photos, sharing about our trip together, and even watched the American TV sitcom, Fresh Off the Boat, showcasing the cultural humors of a Taiwanese family living in the US. We enjoyed watching Korean drama, movies, Fresh Off the Boat, and amazing race together. Grandma’s favorite card game with us was Bluff. “I am not stubborn…” grandma refuted immediately. “See…Dad reacts the same way. He also doesn’t admit he is stubborn!” Joani laughed loudly. 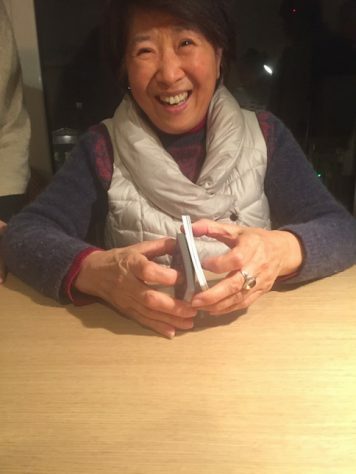 While traveling with us, Grandma learned how to shuffle cards. Grandma sometimes have difficulty mastering new technology. “So much so that someone thought you two were a couple in Vienna!” Olivia laughed, and we all couldn’t stopped laughing for minutes! 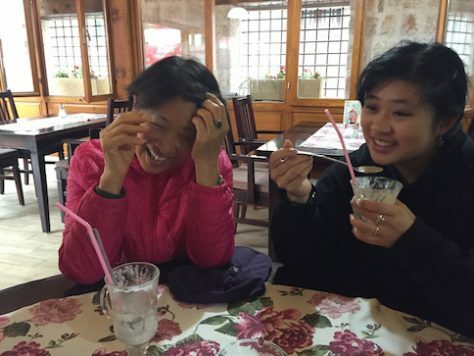 We made many laughs with Grandma over meals throughout our one month trip with her. “That person was horrible. How could his eyesight be so terrible,” my mom laughed. “No, it was not the person had bad eyesight. It was because you looked too young!” Joani said sweetly. “I am amazed at how you three children are so obedient. Eight years ago when you backpacked in South America, I felt so sorry for you, carrying so much luggage on your back,” grandma shared. “Now that you travelled with us, do you still feel sorry for us?” Olivia asked Grandma amusingly. Grandma carried her own luggages often, not wanting us to carry extra baggage for her. “So Grandma, would you backpack with us again?” Joani asked curiously. Grandma laughed again. And we all laughed as well. 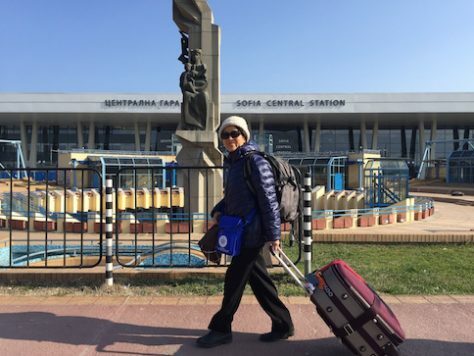 Grandma is our newest Su Family backpacking adventurer. “As long as you feed us chicken heart, gizzards, and chicken skin, we are satisfied,” laughed Olivia. “Yes, that’s another thing I learned from traveling with you. Before, I often scolded you, ‘Don’t eat instant noodles!’ Now I know that sometimes you can’t help it,” Grandma laughed. “Yeah, I remember when Grandma was eating instant noodle in Vienna she said, ‘This is delicious…delicious poison,” Nathan recalled. “So now that you travelled with us, what is our travel style?” Olivia continued to question Grandma. “…Traveling with you, I learned…that you have the bad habit of sharing food by passing it from one to another, that you are incredible in traveling with so few clothes, that Jonathan spent a lot of time planning for the next leg of the trip, that you like to have lots of activities at night such that I couldn’t sleep early…” grandma went on and on. We had a farewell dinner with Grandma at a nice pasta restaurant in Zagreb, Croatia. After leaving Bosnia for Croatia, we spent our last night together with Grandma at Zagreb. Again, Grandma treated us to a restaurant meal for our farewell. There Grandma shared more memories of our time together. Grandma enjoyed her one-on-one date with Olivia. Olivia made a goodbye poster for Grandma. 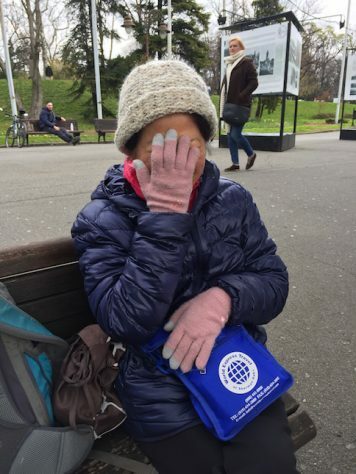 At the airport, my mom told me that she will deposit some fund in my bank account and made me promised that I will not keep any of the money but to use it for the children in Europe so that they can eat well, sleep well, and travel well. “Don’t forget to treat them to escargot in Paris!” She told me as she left for the gate. 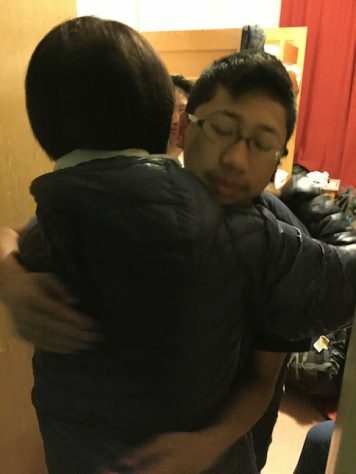 For many days after Grandma left, we all felt something was missing. When I set up the table, I would naturally put up six sets of utensils. 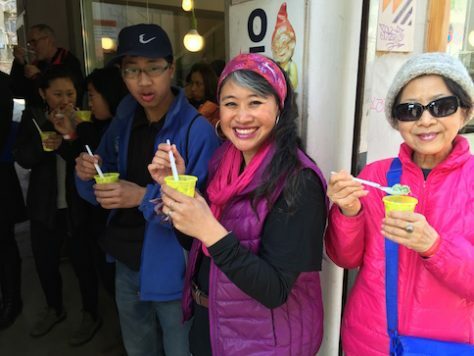 When we ate tasty local food, we would say, ‘Grandma would have enjoyed this.’ This trip, the children have gotten to know and love their grandma even more. One day lying in bed at night I thought about the one month of travel with my mom. I suddenly had a new understanding. When I was a child, my mother took really good care of me. She made sure that I had good food to eat, warm clothes to wear, and bring me where I needed to go. 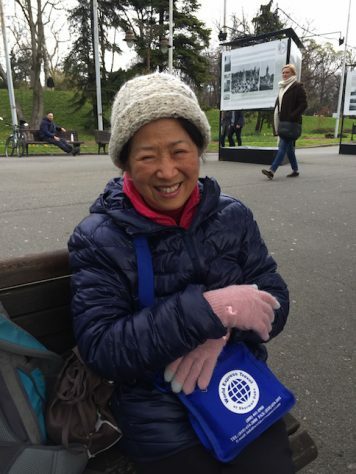 This trip in Eastern Europe, thirty some years later, she was no longer able to be in charge of taking care of our food, shelter, and transportation. But a mother is always a mother. At the age of seventy-three, my mother in her own way was still taking care of me and the children as well. 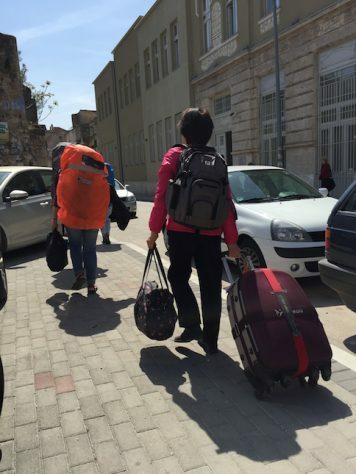 She made sure that we don’t hurt our backs carrying our backpacks by paying for the taxis and carrying her own bags. She made sure that we ate healthy by treating us to nice meals. She asked that we book 1st class seats so that we can slept better. No matter young or old, it is a blessing to be loved by a mother. Good food brings out the excitement in Grandma. Grandma is our newest member in the Su Family Backpacking Team. A timely post. We frequently traveled with “grandma” and, years later, we’re certainly glad we did! I miss you all very much! Take care of your beautiful energy granny! 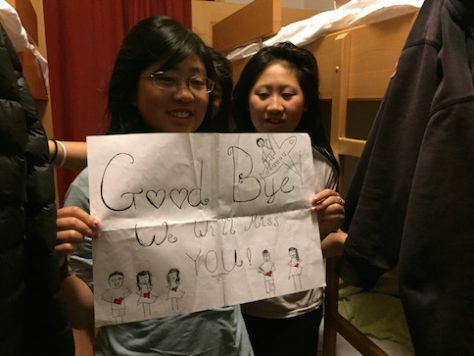 We miss you too in Kyrgyzstan!